In return, you get a sleek little box that offers access to all the major streaming platforms in Australia, in a simple straightforward way. 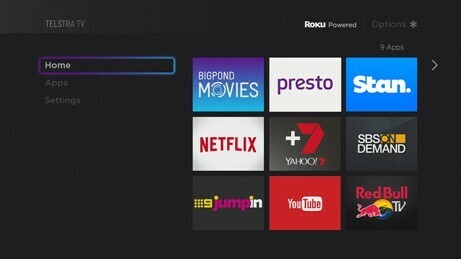 While many may not have heard of the ‘Roku’ brand in Australia, they’ve produced a number of set top boxes around the world, and they enjoy a very vast range of apps available to install and enjoy. The Telstra TV is based on the Roku 2, but more restricted – you don’t get access to the great big Roku library of apps, many of which wouldn’t make sense in Australia anyway being Cable TV apps (like HBO Now), but even universal apps like Spotify, Plex and Pandora are absent. On the flipside, if you import a unit from overseas you’ll miss out on local Australian apps. Currently there’s just a handful of apps there to enjoy on the Telstra TV – Presto, Stan and Netflix fill in the SVOD gaps, and you’ve got catch up services from SBS, PLUS7 (no live streaming yet), 9Jumpin, and Tenplay (one glaring omission is ABC’s iView). If you’re keen on buying/renting movies, you’ve got BigPond Movies to enjoy. There’s also a handful of other apps, like GoPro, YouTube and RedBull, available (and if you’re really eager, you can throw the device into development mode and sideload a single app at a time, like Plex. This is generally frowned upon though…). 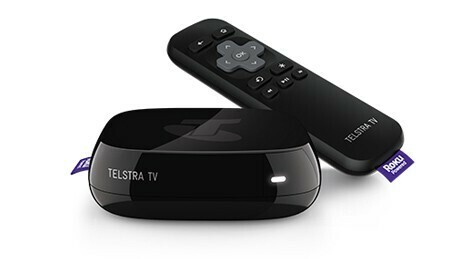 At the moment, the Telstra TV has the edge over other devices like the Apple TV, which only has Netflix, Stan and TenPlay available as native apps. For lucky Telstra TV owners who get a unit before Christmas, Telstra will help sweeten the deal with 3 months of Presto, 3 months of Stan, and an extra $15 of BigPond Movies credit – altogether valued at $90. Of course, should you wish to stick with one of the services past three months (or you’re a Netflix kinda guy), you’ll need to keep paying for these separately. Fans of content legitimately available in Australia will be happy with the Telstra TV – it’s the only unit with access to all the major streaming services, as well as Australian catch up apps (except iView!). Other units (Apple TV, Playstation 4, Xbox One, etc) tend to be hit and miss, and often ends in resorting to pulling out a mobile phone and casting from the app on there. Telstra home broadband customers can enjoy Presto and BigPond Movies as much as they like without worrying about churning through their data quota, however the other services will count (Netflix, Stan, TenPlay, etc). If you’re a new or recontracting Telstra customer, they’ll throw in a Telstra TV on the higher end bundles, or you can grab one outright for $109. While it’s great to have access to almost all of the local services/content for Australia, the Telstra TV probably won’t be flying off the shelves. Perfect for new Telstra customers – being a freebie, or as a Christmas present for your parents, other folks probably already have similar set top boxes or options available (like the PlayStation 4, Apple TV, or even a Chromecast). Things like ‘Universal Search’ would’ve been wonderful – make a single search and have results shown from all of the apps on the Telstra TV, rather than having to check each individually, especially across Netflix, Stan and Presto. And access to the Foxtel options from the T-Box are sorely missed, especially since Foxtel Play is available on other devices (like the PlayStation 4) – it would go great on the Telstra TV, and provide yet another easy way for people to become Foxtel customers. Telstra TV is a great way to start a streaming video journey, and while many of you may already have devices that do the bulk of the streaming work, it’s hard to say no when presumably many of them will be free inclusions for new and recontracting Telstra customers. Oh, and it does screen casting/mirroring too, which might be a nice little bonus for folks with recent Android or Windows devices.